In her role as director of Center of Excellence in Teaching and Learning, Dr. Lynn Baynum gets the 30,000-foot view, seeing how all the parts work together to improve academic initiatives. Baynum has always held a deep appreciation of learning. She double majored in education with early childhood and elementary education and minored in American history at East Stroudsburg University. Attending a State System school was important to Baynum, because she said “the State System creates the most outstanding educators.” It was during her senior year of college that she talked with one of her professors about a career in teaching and realized she wanted to teach everyone. Baynum described her teaching style as social constructivism. Rather than focusing on letter/numerical grades, she focuses on growth and working together. That idea of teamwork and the notion that “we’re all together” helps her excel in her administrative roles. She relishes the academic exchange of ideas. Baynum has served as the interim dean of the college for the last two years and is incredibly grateful for the opportunities it has afforded her. She’s learned that her “lens of the university is no longer tied to just the course or department but understanding how it all fits in the whole culture.” By working with associate deans in other colleges, she has learned about the policies and practices that impact all students. She realized issues she thought were solely related to the Teacher Education Department exist in other programs. Students struggle with similar challenges. Some have financial issues, personal issues, or anxiety. Professors see that these obstacles are normal, but that students can achieve their dreams with perseverance and persistence. In her position as the director for the Center of Excellence in Teaching and Learning, Baynum connects with other faculty who might have similar ideas but different challenges in their disciplines. They’re aiming to create a shared mission, and they’re building new strategies. While she knows that her knowledge of education is important, she also is aware that her strategies will not work for every class or department. There is a strong need to hear from one’s peers and colleagues about their own strategies. As the center director, Baynum is developing strategies to implement in academic programs that will enhance faculty and student performance and understanding. Focusing on topics such as initiatives for faculty professional development and student success rates, she is spearheading a campaign that will bring a more rounded and developed curriculum comprised of supporting student success and retention by improving faculty teaching styles. To improve these styles, she is adopting and implementing high-impact strategies focused on retention and completion among diverse students for faculty to use in classes. 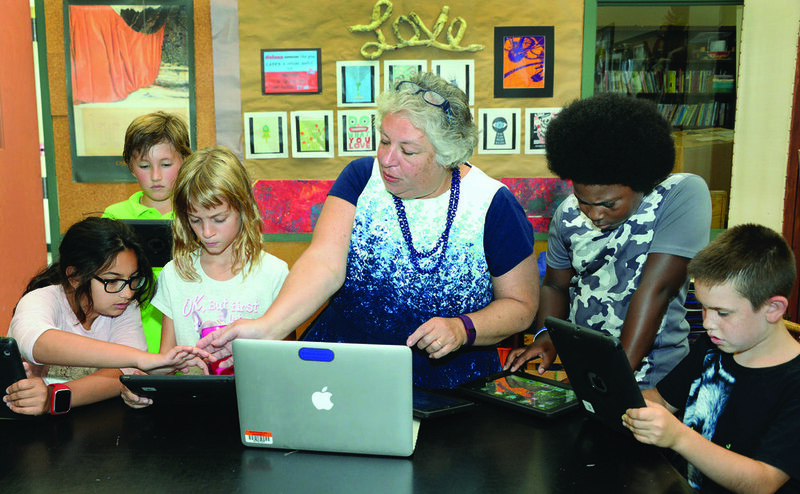 Baynum encourages innovation in the classroom, and when it comes to technology, she promotes finding new ways to implement it efficiently and effectively. In one class, her students discovered they could use Snapchat to scan QR codes that were needed for a lesson. She relayed this to her students in her subsequent classes and when appropriate, the use of technology in her classrooms became the norm. Baynum’s approach to teaching exemplifies the value of lifelong learning. Even a teacher with decades of classroom experience has new things to learn. Director of the center is the ideal post for furthering that value to colleagues and students. Ciara Rafferty ’19 is an intern for SU Magazine.